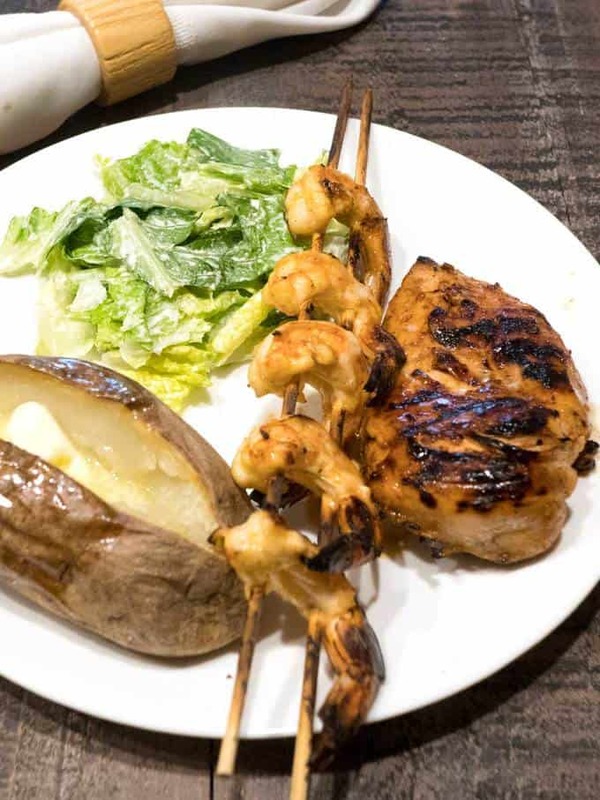 Who doesn’t love tender juicy chicken and succulent shrimp? Add a delicious tequila lime marinade and the flavor of grilling, and you have a perfect meal for Cinco de Mayo! I had a meeting downtown close to the local fish market, and decided to pop in and buy some shrimp if they looked fresh. Well, they looked wonderful, so I texted the Master Taste Tester and suggested Tequila Lime Grilled Chicken and Shrimp for dinner. He quickly responded back with an enthusiastic Yes! I used the following ingredients for the Tequila Lime Chicken: Boneless and skinless chicken breasts and thighs, tequila, fresh lime juice, olive oil, honey, garlic, chili powder, salt, and freshly ground black pepper. For the Tequila Lime Shrimp, I used fresh peeled and deveined shrimp, tequila, fresh lime juice, olive oil, honey, garlic, chili powder, salt, and freshly ground black pepper. As you can probably see, I used the same marinade ingredients for both the chicken and the shrimp. After I mixed together the chicken marinade, I reserved about 1/4 cup for basting during the grilling. Then, I poured the rest of it onto the chicken that I had placed in a ziploc bag. I pressed as much air out of the ziploc bag, sealed it and refrigerated the chicken for about six hours. I knew that the lime juice would react with the shrimp by “cooking” it, so I limited the time that the shrimp marinated to just one hour. First, I de-headed, peeled and deveined the shrimp, leaving the tails on. Even though it’s pretty gross cleaning them, I always buy head-on shrimp because they tend to be the freshest. Then, I mixed all of the marinade ingredients together, and poured the marinade onto the shrimp. After tossing the shrimp to ensure that it was well coated, I covered the bowl. I refrigerated the shrimp for one hour. In the meantime, I soaked the wooden skewers for the shrimp in some water to minimize their burning while on the grill. The Master Taste Tester is in charge of the actual grilling. He prepared the charcoal fire – we still do it the old fashioned way with charcoal in a Weber grill! I prepared the shrimp for grilling by using I two skewers per five or six shrimp. Susan taught me the trick of using two skewers. This keeps the shrimp from randomly turning, and makes it much easier to turn the shrimp during cooking! First, The Master Taste Tester grilled the chicken, basting it often with the reserved marinade. This took about 20 minutes. 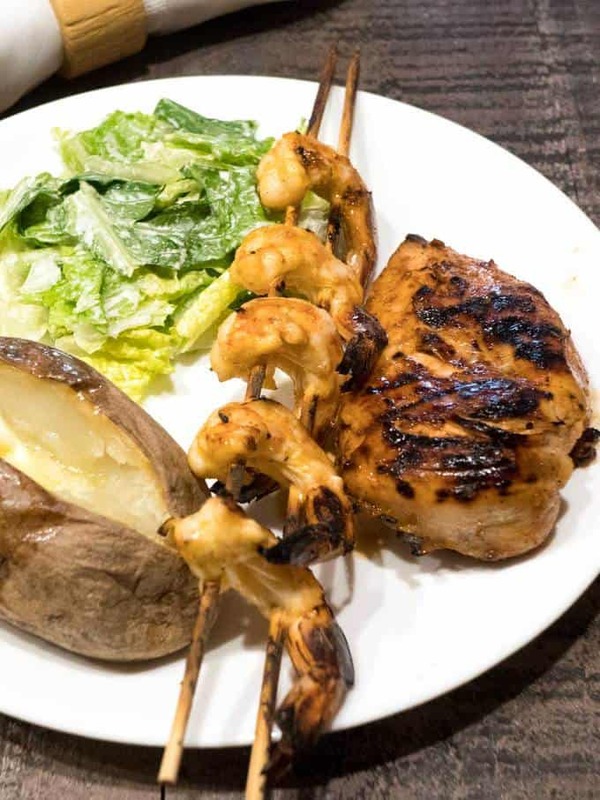 When the chicken was done, he removed it and grilled the shrimp, turning them often. This took another 5 minutes. Both the chicken and the shrimp were absolutely delicious! The chicken was moist and tender, and the shrimp, full of flavor. I served the chicken and shrimp with a baked potato and Caesar salad. Yum! Tequila Lime Chicken: Trim chicken of fat; place in gallon ziploc bag. Combine all chicken marinade ingredients. Reserve 1/4 cup of marinade. Pour remaining marinade onto chicken. Press as much air as possible from ziploc bag; seal. Refrigerate for 6 hours or up to overnight, turning bag several times. 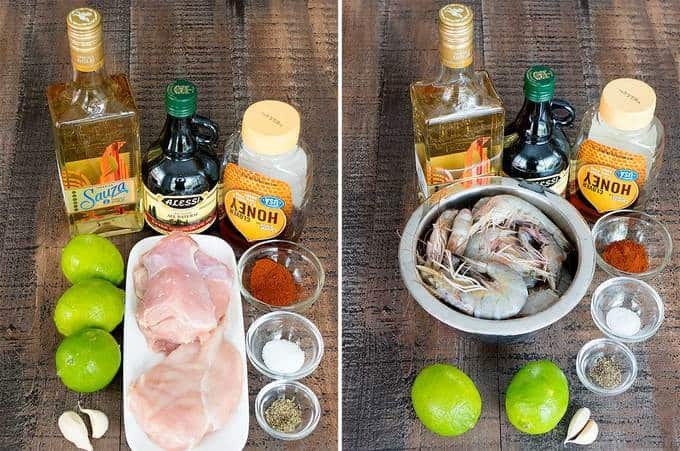 Tequila Lime Shrimp: De-head, peel, and devein shrimp, leaving tails on shrimp; pat dry with paper towels. Place in non-reactive bowl. 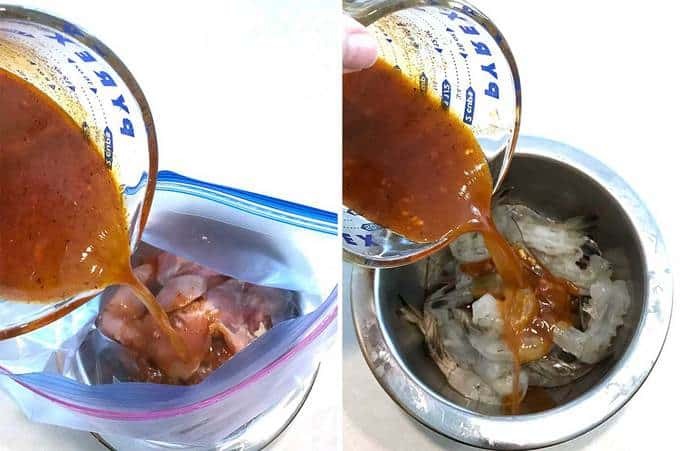 Combine all shrimp marinade ingredients. Pour over shrimp; stir to evenly coat. Cover with plastic wrap and refrigerate for one hour. Do not marinate for longer than an hour because the lime juice will begin to "cook" the shrimp. 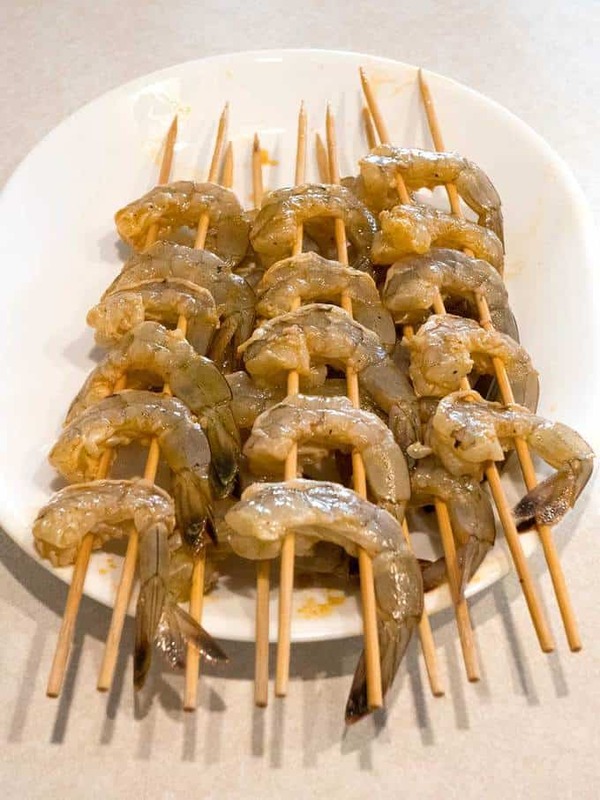 While shrimp is marinating, soak 10 to 12 wooden skewers in water. 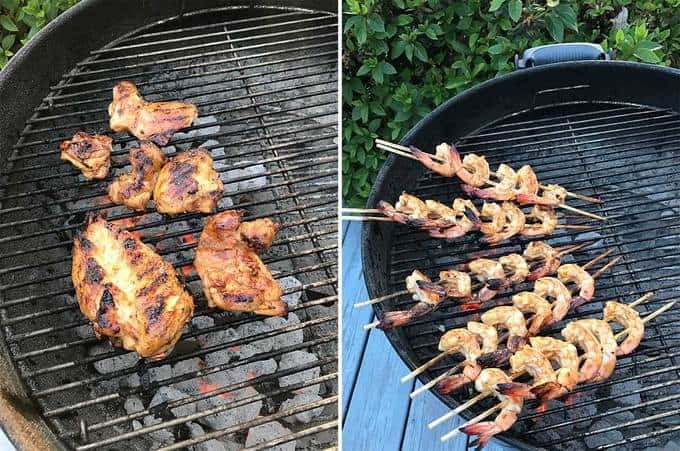 Remove shrimp from marinade and place 5 to 6 on double skewers. Grill chicken over hot fire, turning often and basting with reserved marinade, until done; about 20 minutes. Grill shrimp over hot fire, turning often until done, about 5 minutes.